Anastrozole “Magnum Anastrol” is a drug group of aromatase inhibitors used in bodybuilding as a means of preventing the aromatic effect (conversion of testosterone to estrogen) when taking anabolic steroids. Alternative drugs: Letrozole, Exemestane (Aromazin). For prevention (in bodybuilding): 0.5 mg every other day. For the treatment of gynecomastia: 1 mg every day until the symptoms disappear (further 0.5 mg every other day). When using steroids with a short half-life (testosterone propionate, methandrostenolone): after 10 days of the course, take an estradiol test and take 0.5 mg Magnum Anastrol every other day. Then, after 10 days, again test for estradiol and adjust the dosage of Anastrozole according to their results. When using steroids with long esters (enanthate, sustanon, cypionate): after 3-4 weeks of the course, take tests for estradiol and take 0.5 mg Anastrozole every other day. Then, after 10 days, again test for estradiol and adjust the dosage of Anastrozole according to their results. The dosage of Magnum Anastrol can also be adjusted on the basis of subjective sensations. 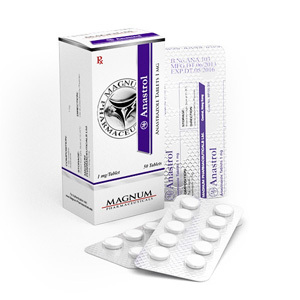 If you receive depression, erectile dysfunction, or a decrease in libido, this means that the dosage of Magnum Anastrol should be reduced.